Whispers in the Loggia: "Dialogue"... And Its "Non-Negotiables"
And so, the countdown's officially on -- this time next month will see the beginning of the long-awaited "doctrinal dialogue" between representatives of the Holy See and the leadership of the Society of St Pius X with an eye to securing one of Pope Benedict's most cherished internal priorities: the lead traditionalist group's return to full communion with Rome. 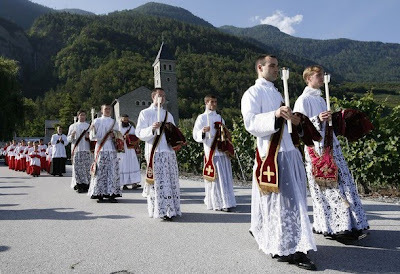 It is not clear what will happen if the SSPX does not accept the Vatican's conditions for reintegration. Its bishops and priests have only been readmitted to the Church as individual Catholics and are not recognised as official clergy. Best known as the lead editor of what became the Catechism of the Catholic Church, Schönborn triangulated the Austrian church's response to the Lefebvrist remit amid especially heated reactions to the move there. For his part, however, Fellay categorically stated in a July interview that the Society "will not make any compromise on the Council. "I have no intention of making a compromise," he said. "The truth does not tolerate compromise. We do not want a compromise, we want clarity regarding the Council." While three priest-theologians will reportedly represent the Holy See in the dialogue, the talks will be overseen by the Congregation for the Doctrine of the Faith, into which the Pontifical Commission Ecclesia Dei -- the dicastery responsible for relations with traditionalist groups -- was integrated in early July.